I live about 25 miles north of London in Harpenden. Herts. U.K.
After working for many years as an Occupational Therapist, I gained a degree in adult education before changing direction in 1991 to pursue my interest in patchwork and quilting. Since then I have published 9 needlework books and developed 3 design drafting tools, a Celtic pattern, e book and 6 DVD's. More DVD's are planned. The subject matter of my books has varied from Celtic design, through geometric, floral and perspective patchwork to photo realistic appliqué and innovative techniques using furnishing fabric. All my techniques are machine sewn. My books are well known for their clear, comprehensive , simple instructions. I have contributed to or been profiled in quilting magazines and books in U.K. Japan, U.S. New Zealand, Germany and Ireland. My quilts have been exhibited in European Quilt Expo in Barcelona in 2002, in Budapest and in the International Celtic Exhibit in Reno, Nevada and Redding, California 2003. Awarded 2nd place for pictorial quilts at U.K. I have been a guest on six U.S, 'Sewing with Nancy' ( Zieman) T.V. programmes to demonstrate my techniques and have judged shows in Spain, New Zealand and at the National Patchwork Championships in 2003 and The Festival of Quilts 2004/5/7&8. 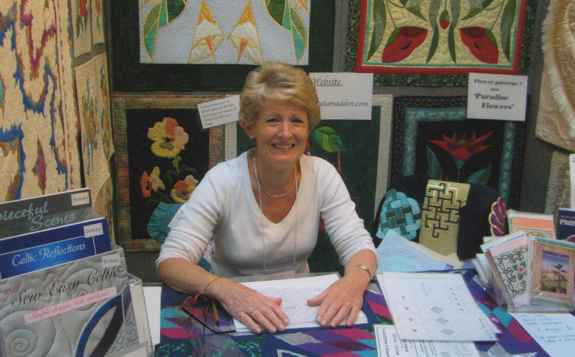 I have taught and demonstrated at the International Quilt market in Houston, Texas each year from 1996-2003 and taught by invitation at the Martha Pullen Quilt Academy in Alabama in 2003. In 2010 and 2012 i was part of the U.K. team invited to create and model garments for the 'Fashion Sans Frontiers' show at the Festival of Quilts at the National Exhibition Center in Birmingham and was awarded a gold medal for my garments. 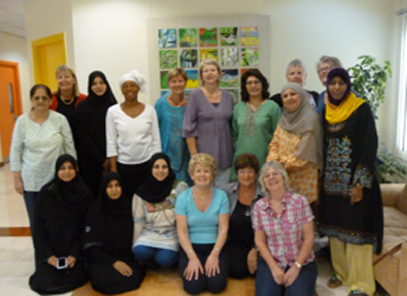 International teaching has carried me to guilds, shops and shows in Australia, New Zealand, U.S.A. Spain, France. Ireland, South Africa, Taiwan, Japan, Sweden, Canada, Oman and Israel as well as all over the British Isles. I look forward totaking workshops for groups all over U.K. during 2019, and teaching Celtic design on a Summertime cruise to Dublin and the Norwegian Fjords in August 18th -29th details from Stitchtopia craft holidays at Arena travel full details will be on this site very soon. Why not come and join us, I promise that we will have fun! See video of 'Fashion Sans Fontieres' show..